This program introduces toddlers to martial arts through a variety of engaging games and activities while improving their coordination, ability to follow directions, and basic knowledge of things such as counting, colors, right, and left. Students will learn to stand "on guard" to protect themselves and gain exposure to basic blocking, punching, kicking, and yelling techniques. This kids program is a fun, exciting introduction to martial arts which entertains and educates kids with a variety of engaging games and activities while exposing them to basic punching, kicking, blocking, and takedown techniques - the building blocks for their martial arts training! Includes a ten rank sash system which gives kids tangible representations of their knowledge of punches, kicks, takedowns, and their ability to use them in combination during supervised sparring matches. ﻿Students learn how to control their partner, keep dominate position, and safely apply submissions. The grappling program for kids includes an eight rank belt system to help them see the progress they've made and give them something to work towards. Students train no-gi during the warm months and gi during the cold months. WHY ENROLL YOUR CHILD AT EPHRATA MARTIAL ARTS? At Ephrata Martial Arts, we work hard to make sure that your child’s experience in the martial arts is fun, safe, and productive. Ephrata Martial Arts offers the Ephrata and Lancaster County area’s best martial arts classes for kids. The children’s martial arts classes at Ephrata Martial Arts include age specific classes with a mixture of different martial art styles taught, such as Kickboxing, Sanshou, Grappling, and SAMBO, each of which has its own physical and developmental objectives. Each discipline of the Kids program at Ephrata Martial Arts fosters each child’s personal growth by providing them with attainable goals, and creating a healthy support system and positive learning environment in order to help them achieve those goals. The martial arts classes for kids offered by Ephrata Martial Arts promote healthy habits in all aspects of mental and physical health. Structured, well-staffed classes provide kids with personalized attention. Children build character and socialize in a fun, exciting, and positive learning environment—developing valuable social skills, listening skills, discipline and concentration. Parents of the students at Ephrata Martial Arts rave about the change they’ve already seen in their children—reporting better behavior inside and outside of school, improved grades and work ethic, and a more outgoing personality—all reasons why they keep their children enrolled in the martial arts programs for kids at Ephrata Martial Arts year after year! The high energy kids martial arts classes at Ephrata Martial Arts are designed to keep kids moving—a healthy alternative to television and video games! Kids that train at Ephrata Martial Arts improve their cardiovascular endurance, flexibility, balance, and strength. Childhood obesity is the top threat to our children’s health and physical well-being. As the nation’s public schools continually reduce the time allocated for recreation and physical activity, there’s never been a better time to explore activities for kids outside of school. In recent years, an increase in diagnosed cases of ADHD, ADD, and reported behavioral issues in and out of school has left parents looking for a solution. The children’s martial arts classes at Ephrata Martial Arts are designed to improve your child’s attention span, respect for self and others, and self control—providing parents with a healthy, supportive outlet for their children’s energy and enthusiasm. The instructors at Ephrata Martial Arts have knowledge and experience working with children who have ADD, ADHD, aspergers, autism, and other behavioral issues. Ephrata Martial Arts strives to reinforce positive moral characteristics like respect, self discipline, patience, confidence, and courage. 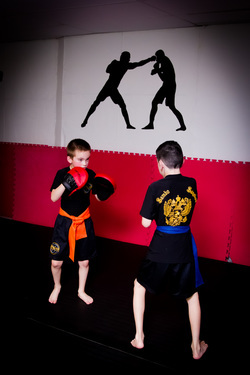 Kids gain a healthy self-image through their accomplishments in the kids martial arts classes at Ephrata Martial Arts. Empowered with these life skills, your child will have the confidence and inner strength needed to succeed in all aspects of their lives. Bullying is a leading cause of school absences across the United States. Ephrata Martial Arts advocates principals of conflict resolution, personal responsibility and avoidance, which benefit both the bully (by teaching them to respect others), and the bullied, (by teaching them how to diffuse a situation or defend themselves if need be).